We received hundreds of World Cup-related projects across illustration, design, animation and even embroidery during this tournament. We've looked through them all so you don't have to - to bring you only the best and most inspiring projects from around the globe. 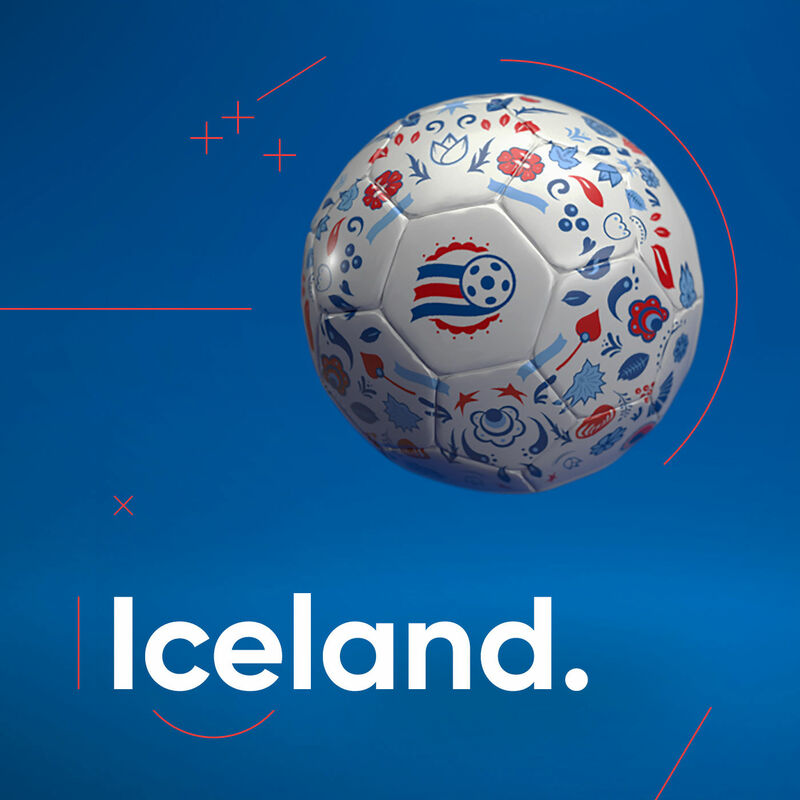 England are out and the FIFA World Cup 2018 ends this Sunday July 15th, but the spirit of the tournament will live on in an abundance of creative projects related to the game that really raised the bar for sports-based artistry and promotion work. 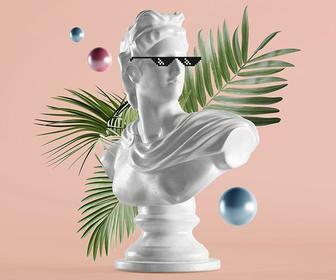 To highlight these beauties we've put together this round-up of the best art and design projects from the tournament, extending not only to the ambitious and beautiful, but also the downright strange. Highlights include online kids' animation for the BBC and Soviet era-inspired wall charts, plus personal projects like Tom Anders Wakins' multilingual fan chant posters and Panini Cheapskates pencil drawings for charity. 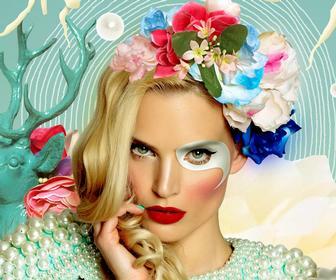 Let's begin with some fantastic portraiture work from HelloVon. 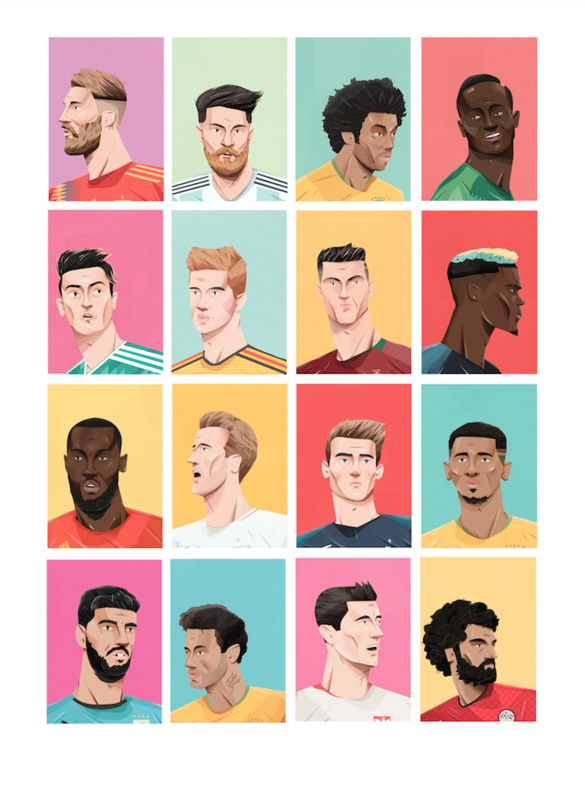 London-based artist and illustrator Von of HelloVon studio recently took on the challenge of drawing portraits of various World Cup stars within the time-frame of 60 minutes. Don't think it can be done? Then watch this time-lapse creation of a portrait of the one and only Gareth Southgate, England manager and new national hero. Other World Cup 2018 names to be taken on in the Faces of Football challenge include Harry Kane and Diego Costa, with the full range available on the HelloVon Instagram. Canadian studio Baboon Creation has put out these tasty football designs as inspired by traditional Russian patterns, but with that little modern design touch. 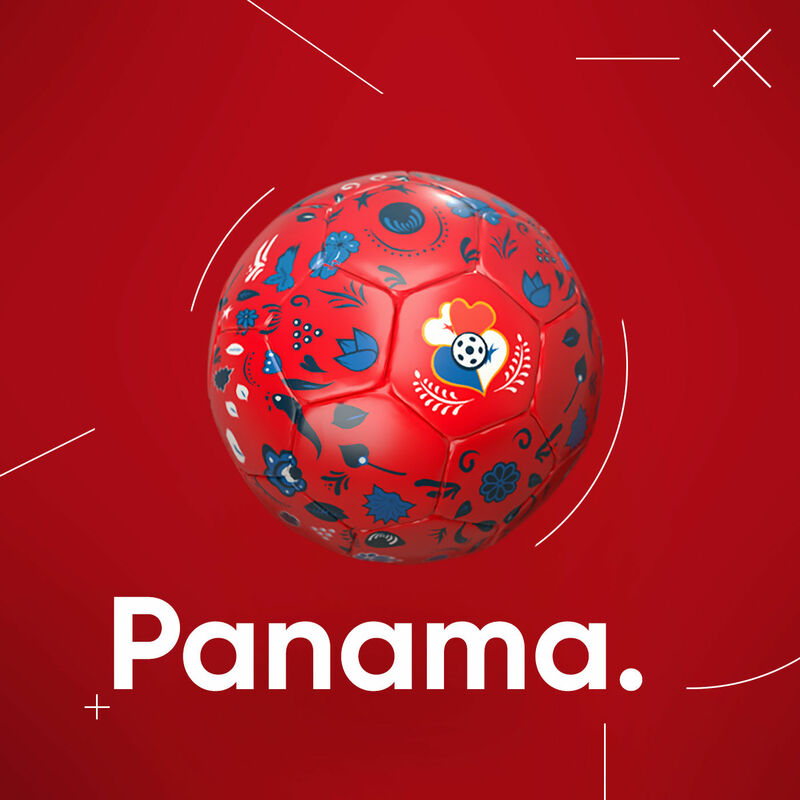 The balls were designed using Adobe's Dimension CC, with research oriented towards the jerseys and symbols of each national team. Each country is represented on Baboon's portfolio page, and our particular faves include those for Iceland and Panama as featured above. In time for the end of Pride Month and its various parades is Same Team Jersey, an activist project from creators ranging from Brazil to the UK made up of rainbow-design soccer jerseys. 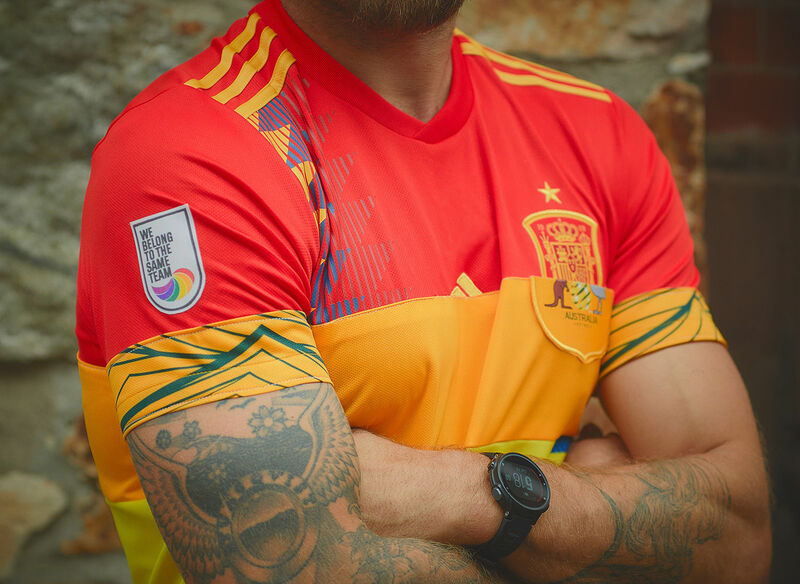 The colourful jerseys bring together the team strips from a multitude of countries across all five continents competing, and include an arm patch that reads 'We Belong to the Same Team.' High-profile supporters include footballing legend Pelé, and world-first LGBTQ soccer team The New York Ramblers. 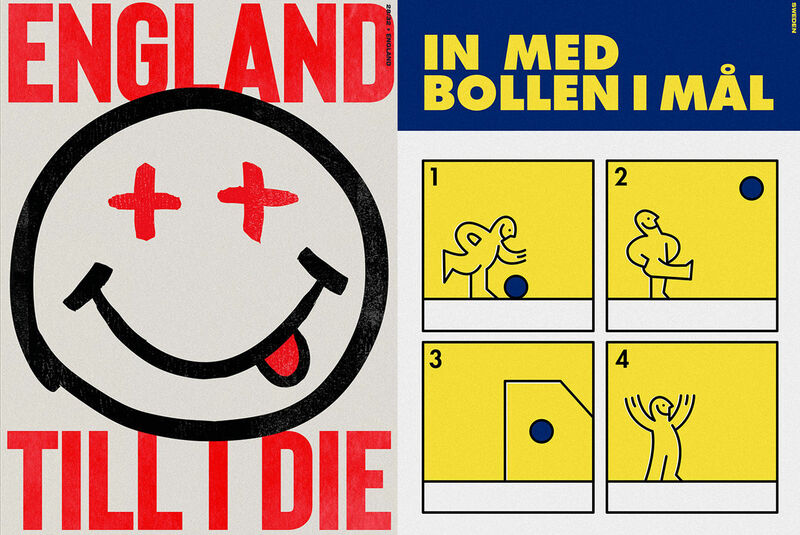 On each day leading up to the games, London artist Tom Anders Watkins designed a poster for each competing team based on a popular national fan chant, with England and Sweden's popular pitch songs getting some particularly lovely-looking treatment below. The posters are a tour de force of design, insignia and typography. All are coloured with the shades of each country's national flags, and written in a variety of scripts e.g. hangul for the South Korean chant, Arabic for Egypt's. Fret not, though, for translations are provided, showing Tom's adept research for the project. The video below is an online spot from Hey Duggee, an animated show aimed at pre-schoolers that's also hugely popular with adults. Created by London-based Studio AKA for the BBC's CBeebies channel, it's a bright and positive show based around a Scouts-style activity group for children lead by a dog called Duggee, featuring endearing characters and a deceptively effortless vector animation style. It's received praise for being representing families with adopted children – one of the children, Happy, is an alligator is brought to the group by his elephant parents. It's also likely the only kids show you've seen with references to Apocalypse Now. Last year, a clip from the show went viral, as the super-catchy, Stick song was shared by parents who grew up listening to Euro-rave tracks like 2 Unlimited's No Limit. For the 2018 World Cup, Stick has become Kick, and a new video has appeared. The BBC has been promoting it heavily across many of its channels, starting a 'campaign' to make it the official England World Cup song and getting kids and sporting presenters involved – and a few of the England team too. London-based designers Gordon Reid and Callum Stephenson invited 20 other creatives – including Hey Studio, the Yarza Twins and Ben Hasking – to create pieces of work based on their favourite, hilarious and weird moments of previous World Cups. These have been printed onto limited edition beer mats which will be showcased in pubs around London, or you can pre-order your own packs for £5 here. They've dubbed the project Weird World Cup. All money raised will go to charity Football Beyond Borders, which is currently fundraising for a new multi-purpose space in Brixton – acting as a ‘safe haven’ for young people in London from disadvantaged backgrounds. Learn more about the Football Beyond Borders here. 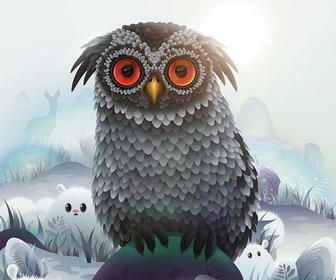 The project has been sponsored by Adobe, and all of the mats were created using Creative Cloud apps, with some also using elements from Adobe Stock. 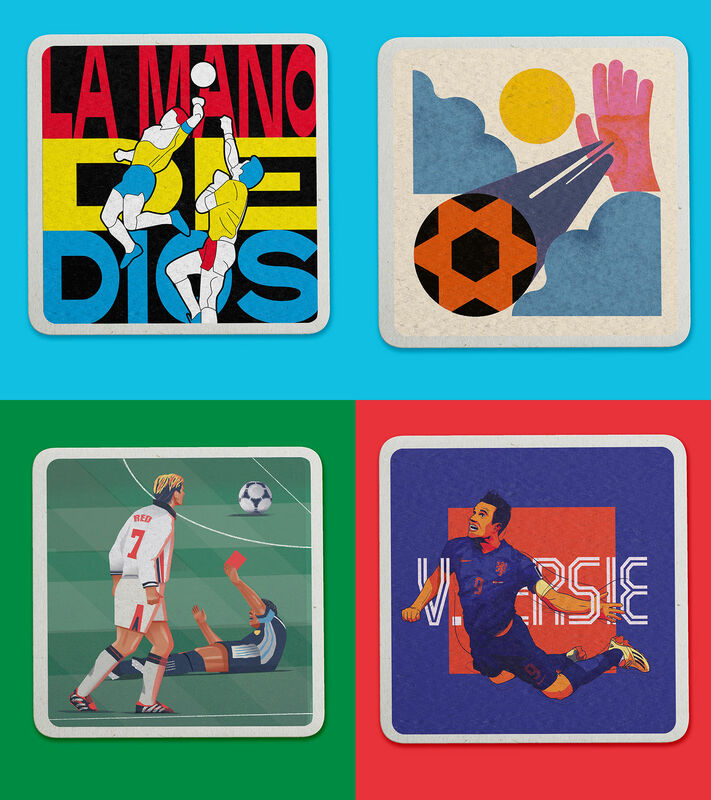 See all the football beer mat designs. LA artist Noah MacMillan has produced a personal project that commemorates a qualifying country every day in the lead up to the 2018 tournament. These colourful papercuts manage to incorporate national colours and world-famous emblems in wonderfully eye-catching collages. "As an American soccer fan," Noah says on his project, "most of the time it feels like I'm living with my own private hysteria (anybody want to hear my 14 theories about Arsenal's summer transfer strategy? No?)" "For one month every four years, though," he continues, "the rest of the world joins me in losing their minds over the game. The World Cup is loud, colourful, chaotic, inspiring, and corrupt. Above all, it's a huge global party (and) I wanted to try to translate that energy into a series of illustrations." We think he's done a good job of it, to be honest. BBC Creative chose the London Embroidery Studio to create an embroidered stop frame animation for its World Cup television trailer – and it’s by far the standout World Cup creative project so far. With a brief outlining the use of Bayeux Tapestry and the graphics of historical posters from the Soviet Union as inspiration, designer Lucie McKenna tells It’s Nice That the team spent months working on the project. London-based animation director Nicos Livesey, who’s worked with Adidas, BBC and Channel 4, turned the beautifully detailed embroidery into a fast-paced, stop frame animation. The animation celebrates the spirit and passion surrounding football through images of players, teams and pitches and recounts of a number of memorable moments, including Gazza’s tears in 1990. In total the team created 650 frames, at 28cm x 19cm, each taking around three hours to digitise and two to three hours to stitch. 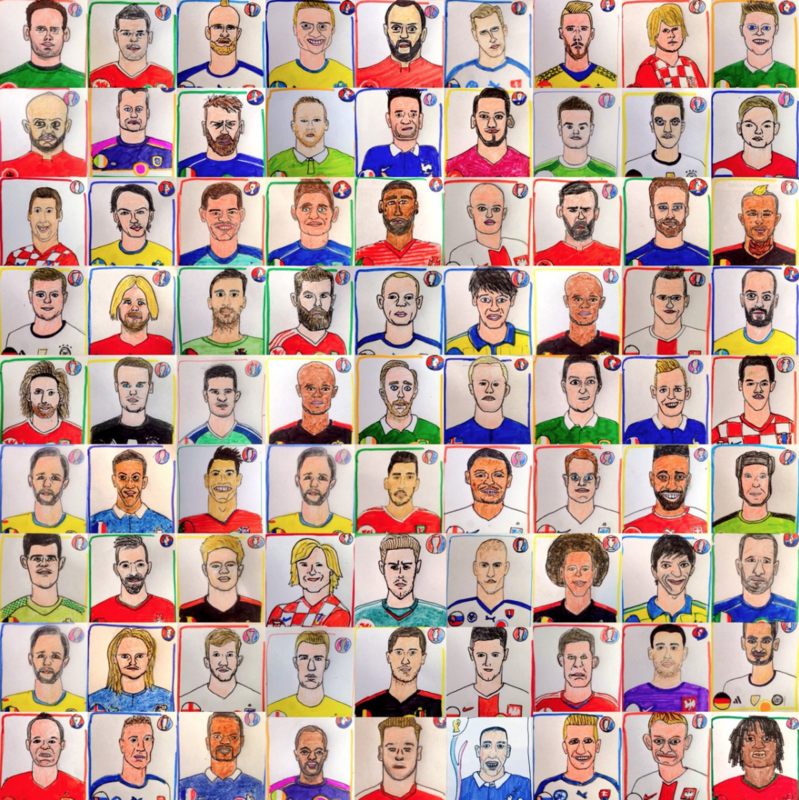 Continuing on from 2014 and 2016, British couple Alex and Sian Pratchett, aka Panini Cheapskates, will attempt to draw every single sticker in the FIFA World Cup official sticker collection by Panini – and all within the timeline of the World Cup – so that’s around 150 hours of drawing over 32 days. Here's an example of the Panini stickers they drew for the UEFA Euro 2016. Alex and Sian have already set up an online giving page which you can donate to selected charities including Cancer Research UK, MacIntyre and Nordoff Robbins. "Despite drawing over 1,500 of these little guys over the past four years, we're still pretty hopeless. We're remarkably resistant to improvement," Alex told us. To keep up with their progress, follow Panini Cheapskates on Twitter. 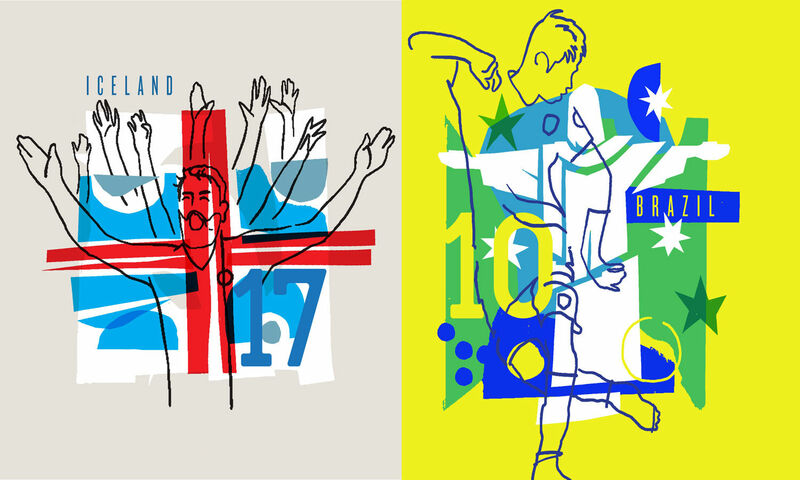 London’s Studio Blackburn and Nirvana Creative Production House (CPH) have collaborated once again on a range of design-led Russia World Cup wall charts, inspired by the style of Soviet-era football teams, Russian Suprematism and the early 20th century art movement. The wall charts are a way for football fans to keep track of results during this year’s football World Cup, set to kick off on June 14. Fans can write down the scores of every match. The design of the wall charts depicts a deconstructed football pitch alongside bold Russian language typography, with a nod to this year's Lev Yashin inspired World Cup official poster. Fans can choose between red, white and blue – the colours of the Russian flag. "We wanted to offer fans an alternative to the garish and unattractive wall charts many fans will be used to putting up with as they plot their team’s progress during international tournaments," founder of Studio Blackburn, Paul Blackburn, explains. The wall charts can be backed on Kickstarter, with early bird backers able to claim their chart for a reducer price of £20. Backers can also opt for the limited gold foil version for £50, although the charts will ship to the UK only. The Kickstarter has a goal of raising £5,000 by May 29, with an estimated latest delivery date of June 12, so you can get marking results in time for kick off. The renowned Russian artist Igor Gurovich has chosen Soviet goalkeeper Lev Yashin (debated as the greatest goalkeeper in footballing history, and a symbol of Russian football) as the central figure for his work on the 2018 FIFA World Cup official poster. He also incorporates 1920s-style, post-constructivist graphics and posters, with work from Dziga Vertov and the Stenberg brothers as points of inspiration. Russian post-constructivist posters have become one of the most iconic elements of Russian history, says Igor, whose poster plays on the fact that this historical visual language is "unquestionably thought of as Russian", he tells Dezeen. According to Igor, the rays of sunshine in the background of the poster are based on a motif commonly seen in constructivist artworks. They are intended to symbolise the "tournament’s energy". Similar to the BBC, ITV has already unveiled its World Cup promotional spot for its coverage of the tournament. Created with German director Hauke HIlberg, the promo touches on iconic historical moments from previous World Cups using a dizzying combination of existing footage, social media integration, post techniques and specially shot scenes. The voice over, which calls football fans to forget the highs and lows of previous World Cups, is Ashley Walters. It’s an interesting concept, but brings a fresh perspective. However, one part of it has been accused of being very similar to an older illustration by Yuko Shimuzu for football magazine 8 by 8. We recently interviewed Yuko about her work on The Folio Society's new collection of Japanese folk tales. On the topics of creative projects for a good cause, British illustrator and lecturer at Bath Spa University Tim Vyner has created a series of reportage illustrations of children playing football during the Street Child United World Cup. It's an event that took place just before the World Cup which connects street children from across the globe to take part in their own international football tournament. Tim drew a series of reportage illustrations on his iPad telling the stories of young children from 24 national teams playing football. Here’s an animation showing his creative process of a team warming up before the game. Joe Waldron is a freelance illustrator in Bristol, represented by Jelly London, who creates editorial illustrations for a number of high profile publications, such as The Washington Post, The Telegraph and the Financial Times. Using his signature angular characters, he’s put together this wonderful collage of football players ahead of the World Cup. His work has also been exhibited at The London Transport Museum, Jaguar Shoes & Urban Outfitters.